An injury free season has previously eluded Austin but this season he is enjoying an uninterrupted run of football and his teammates are benefiting from it. The Western Bulldogs today elevated defender Mark Austin to the senior list ahead of Sunday’s clash against Collingwood. A look at defender Mark Austin's season in 2013, including key statistics and highlights. 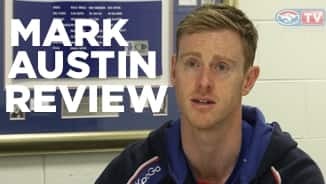 Gifted a second chance on the Western Bulldogs rookie list, Mark Austin embraced the opportunity wholeheartedly. 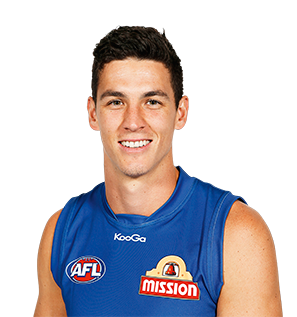 The athletic key defender has been plagued by injuries in the past but managed to string 18 games together over the past two seasons at the kennel. The South Australian initially spent six years on Carlton’s list after being drafted to the Blues in 2006 with their third round selection (pick 35). The tall defender added seven AFL games to his career tally in his second year with the Bulldogs. Austin’s performances for Williamstown as a dour defender earned him a senior call-up between rounds five and seven, and again between rounds 20 and 23. 18 disposals, six marks and four inside 50s against former side Carlton in round 20 indicated that the backman has an attacking edge to his game and can also find the ball. 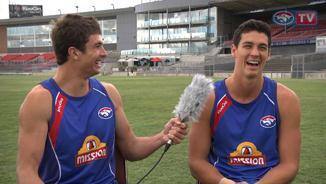 The following week, lockdown efforts on Adelaide’s Tom Lynch and Lewis Johnstone demonstrated Austin’s versatility. Austin’s 18 disposals at 83.3% efficiency was the first of a string of career bests for the 24-year-old against Carlton in round 20. The defender bettered his previous record in inside 50s (four), rebound 50s (four), contested marks (three) and one percenters (five). Named among the best in six of his 15 performances at VFL level is also a credit to the athletic tall. Elevated to the senior list in lieu of Tom Williams - who was placed on the long term injury list - the key defender made his debut for the Bulldogs in Round four against Melbourne. Curtailing the influence of a number of powerhouse forwards in his eleven games, Season 2012 saw Austin grow in confidence and almost double his career game tally. In a cruel twist of fate the 23 year-old fractured his wrist in the Bulldogs clash with his old club Carlton in round 17, which ruled him out for the remainder of the season. A 194cm and 95kg key position player who played 15 games with Carlton, including one last season, after making his debut in 2007. Takes a terrific contested mark and will add depth to the club’s tall stocks.